A beautiful white celebration baby bib perfect for special occasions like Christening or Naming Day ceremonies that you can have personalised with babys name or a little message. A beautiful white celebration baby bib perfect for special occasions like Christening or Naming Day ceremonies that you can have personalised with babys name or a little message. Gorgeous white classic cut baby bib with antique fashion broderie eyelet floral lace pattern on the front and trimmed in white lace. Ties around the neck and measures approx 16 x 18 cms. 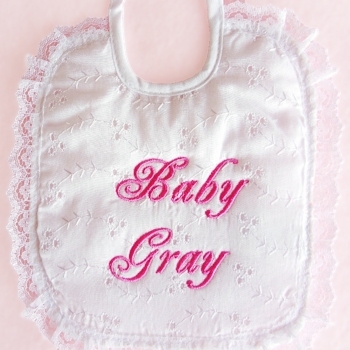 We can personalise this baby bib for you! 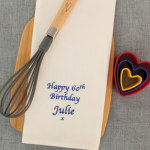 Just fill in any name or short message you would like embroidered and choose a thread colour and letter style too! Size: approx 16 x 18 cms.